Discussions of the nature of Epi-Paleolithic Natufian sites have tended to focus on such questions as settlement patterns and sedentism, commonly within the framework of settlement size and subsistence. Yet perhaps other subdivisions may be no less relevant. Throughout the Natufian in the Mediterranean zone some sites appear to have functioned primarily, if not solely, as cemeteries, e.g. Erq el-Ahmar and Nahal Oren among others. 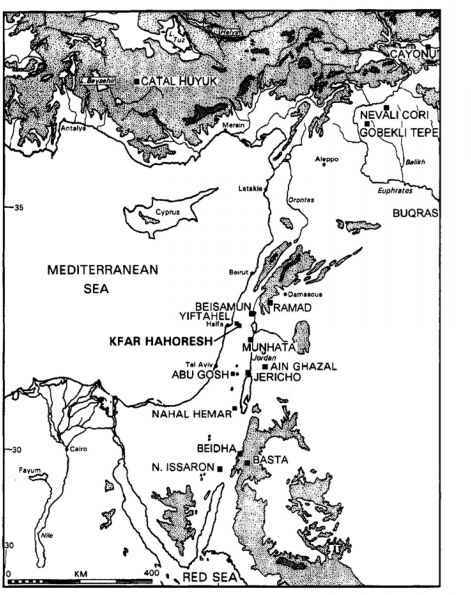 In other (especially Early) Natufian sites in the Mediterranean zone there would appear to be greater physical integration of the cemeteries and habitation areas (e.g.,Early Mallaha, El Wad, and perhaps Wadi Hammeh 27) (GoringMorris 1996). These differences could be related to the degree of mobility of specific Natufian communities in time and space (as indeed the contrast between primary and secondary burials). Indeed the overall parallels to PPNB Kfar HaHoresh and many other contemporary sites are notable in many respects. Furthermore the longevity (some four millennia or more) of the habit of postmortem skull removal in the Levant crosscuts cultural and economic subsistence modes. Again, beginning in the Early Natufian and accelerating thereafter, the practice was commonly, though not ubiquitously, applied to members of both genders. There also appear to be hints that, from at least the PPNA, as at Jericho and Netiv Hagdud (Belfer-Cohen 1990; Kenyon 1981), if not earlier, children and perhaps even neonatals may have been occasionally treated in the same manner, albeit much less commonly. Thus, initially seemingly limited in scope, there is evidence to indicate a time-transgressive trend of increasingly sophisticated embellishments in the subsequent treatment of adult skulls (of both sexes? ),particularly during the course of the PPNB. This appears to parallel the growth in site (and hence community) sizes (Table 1).This includes the daubing of ochre or other pigments on cranial vaults (again beginning in the Early Natufian, for example at Ein el Saratan; Garrard 1991), the application of "wigs,"and the modeling of facial features in the PPNB. This seems to be accompanied by instances of in vivo skull deformation. Skull removal was thus deeply rooted in the belief systems and psyches of the Early Holocene communities in the area. It has been widely accepted that the ritual probably reflects some form of "ancestor cult" or "cultf the heroes" (Bar-Yosef and Belfer-Cohen 1989;Bienert 1991;Cauvin 1972; de Vaux 1966). In light of the major shift in the nature and size of domestic residential units in the Early Natufian (Goring-Morris 1996),could it be that initially skull removal reflects a "cult of the founders"?It thus seems likely that skull removal at that time reflected some form of attained status within the community. However, it is also possible that the significance of the practice evolved through time to one of inherited (ascribed) status and the emergence of social/ritual hierarchies, perhaps in part connected with the distinction between community and private power, title, rights, and wealth and served to encourage social cohesion (see also Bar-Yosef and Belfer-Cohen 1989:63). As such, the tradition probably functioned as a bridge between living communities and their deceased forbears. In contrast to later periods in the Levant (from the eighth millennium bp through protohistoric and even historic periods), when cemeteries were often physically separated from living areas, the earliest Near Eastern permanent settlements appear to initially display a tendency to physically integrate the quick and the dead by the removal of the skull following interment and its reintroduction back into the context of the living community. In contrast, in later periods there is a notable preference for separating the world of the living from the domain of the dead in a tangible manner, in the form of separation of settlements and cemeteries and in the provision of grave goods and furnishings to succor the deceased in the next world. In this respect these would appear to reflect quite separate philosophical approaches to bridging the void separating the quick and the dead. Furthermore, differences in the specific treatments of the deceased indicate some form of increasingly sophisticated and, probably ultimately, if not initially, inherited, hierarchical system in operation in a time trajectory from the Natufian through PPNB (but also combining elements of attained status). In the latter this treatment ranges from the nature of primary and secondary interment, the removal or nonremoval of skulls, through the variable treatment of skulls, including seemingly unmodified, the application of ochre and other pigments to vaults, the application of headdresses or wigs, and the modeling of facial features in plaster or other substances. Interestingly there are hints that the modified skulls are limited to adults, though the gender remains unclear. Although the custom of primary interment beneath lime-plaster floors of habitation structures has been widely reported from the central Levant (e.g.Jericho, Abu Gosh,Nahal Oren, Beisamoun, Yiftahel, 'Ain Ghazal), it is commonly not clear as to the precise chronological order of events: were the interments made during, before or after the structures were in use? The evidence from Kfar HaHoresh would appear to indicate that at many PPNB sites burials and subsequent skull removal commonly precede floor plastering. As such this would seem to indicate that they may have functioned as markers of ownership and even, on occasion, as foundation deposits. This interpretation appears to be bolstered by the presence of what appear to be markers on plastered surfaces at Kfar HaHoresh. Late PPNB. It is likely that this reflects the increasingly larger size of communities and the complex socioeconomic social interactions involved with the introduction of domesticated animals and plants, as well as the breakdown of previous egalitarian lifeways associated with mobile foraging societies. Differential accumulations of wealth are likely to have emerged during the course of the PPNA and become even more pronounced in the PPNB in at least the form of fields and herds, not to mention the exchange of goods. Moreover, the direct economic advantages of larger, extended families would potentially have led to stresses in terms of inheritance unless some form of widely accepted and applied guidelines and deep-rooted belief systems were functioning. Under such circumstances high status members of the deceased would have played a crucial role, hence the physical "return" of selected ancestors back into the world of the living in the form of skulls. In light of the above it appears likely that such high status was inherited, at least in part, given the cross-gender and cross-age nature of the phenomenon. Furthermore, the seeming absence of obvious differentiation in the contexts, such as size and nature of domestic architecture with which the various burial and disposal modes are associated, hint that status was primarily within the context of the extended family or clan rather than at the community level. This would accord with the notion of simple village society lacking any externally obvious community-level hierarchical ranking (see also Chapter 6, this volume). Without doubt the symbolic significance of lime-plaster use as well as combined human and animal interments can also be traced back to the Natufian, presumably reflecting the wide range of ritual beliefs involved.